Blog Disgusted with Disqus Discovery? I like Disqus. If you leave a comment on this post you will see that I am using Disqus comment system on this blog. Disqus (pronounced “Discuss”) is an online discussion and commenting service for websites and blogs that uses a networked platform. If you set up a profile on Disqus then all your posts – across any site using Disqus – are linked together and to your profile. Pretty nifty! However, Disqus recently came out with Disqus Promoted Discovery as part of their new Disqus 2012. Why did I immediately turn it off? Why would I want to send people away from my site? I did not stick around long enough to take a screen shot of what they were showing on the post from Christmas day, but I sure wish I had! Two of the “Recommended” links were each about a celebrity with alcohol or drug problems. One was a paid ad from some investment site. And then there was one other link that I do not remember. None of them have anything whatsoever to do with the content of this blog or the beautiful poem I posted on Christmas day. In fact, they are the antithesis of what I write about here! I write about productivity. I do not encourage readers to go waste time following this or that celebrity’s every move and misdeed. What a waste of precious time and brain energy!! And they listed those links as “RECOMMENDED FOR YOU” (you, the reader) as if I am recommending that sort of dross. That is the carrot they are offering to bloggers. They will pay the blog owner for click-throughs. Interestingly (and not surprisingly) they are being quite vague about how much a person would earn per click-through. Publishers who participate in Promoted Discovery earn money on a cost-per-click (CPC) basis. For each click on a Promoted Discovery link on your site, you will earn a percentage of the revenue. There is no standard revenue share percentage as these percentages vary depending on costs, content and performance. We will continue to ensure publishers get optimal revenue and traffic benefit. Why would you want to send people away from your site? My site is about offering information and tools to readers. I don’t want you to go anywhere! I want you to stay here and poke around the site, read what interests you, utilize what is useful to you. Yes, when I have my ebook ready for you to download, I will have a call to action button. But the ebook is still a ways away. So for now, please explore and enjoy this blog. I am happy that you are reading this. Am I alone in dumping Disqus Promoted Discovery? Frankly, I doubt it. But I think Disqus has done a fantastic job of flooding the web so effectively that posts like this are hard to find. What would make me want to use Disqus Discovery? Notice that I left out the word “Promoted” in that question. Disqus is a great company. And I understand the need for them to make money; which is what this new program is really about. “Promoted” means paid advertising. What I think Disqus needs to do is work on the “Discovery” aspect first and then add in the “Promoted” links. They need to vastly improve their algorithm for determining appropriate links for a site. The factors for determining appropriate links are size and readership of the blog, the content, and especially the content of comments because that says a great deal about the readers. For a blog like this one, appropriate links would go to sites and articles that have to do with productivity, brain injury and rehab, life and time management. It may well be that no one with content like that has purchased ads yet. Fine, then wait. Under RECOMMENDED FOR YOU list other blogs using Disqus; ones that have similar or related topics. 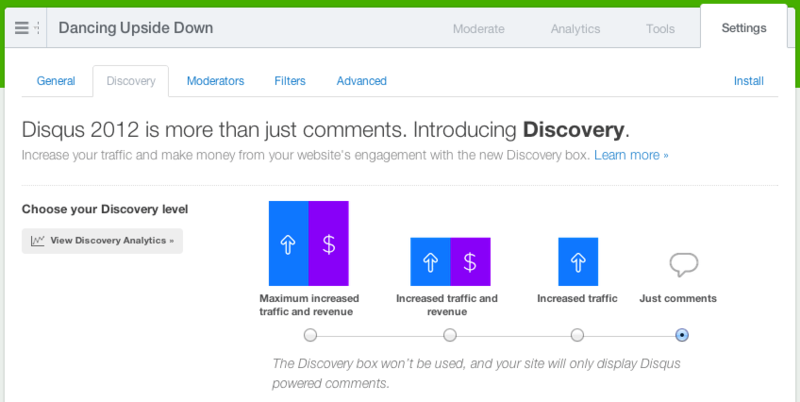 Allow for true discovery and Disqus will strengthen bloggers and commenters trust in them. Disqus is not doing themselves or anyone else any favors by alienating their bloggers and commenters, especially their small bloggers and our readers. Just like drops of water add up to make an ocean, we add up to a very, very large number of content creators and readers. How do I disable Disqus Promoted Discovery? Disqus recently did an update to Disqus 2012. Now under Settings there is a tab for the Discovery options. If you select to entirely turn off Promoted Discovery you will see an orange warning and a request to fill out a two question survey. The survey is simple and includes a comment box. I encourage people to comment. They need to hear from all of us.